Getting more sales is not as tough as you think it might be. Today, we are going to talk about metrics — how much to price something, how much profit you need to make, etc — there are tons of them. 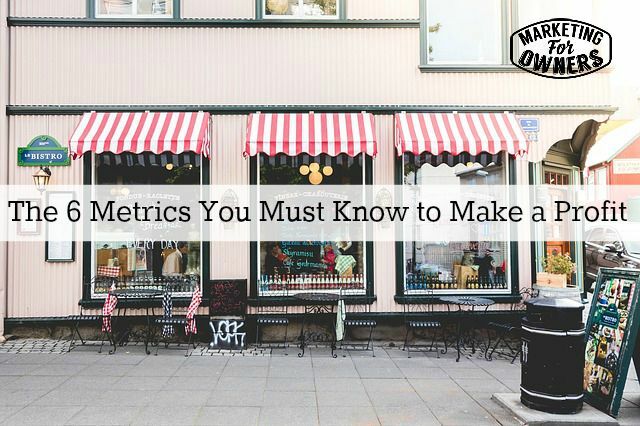 While there may be many metrics, there are 6 main ones you need to know. 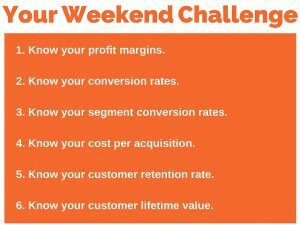 Now this is your weekend challenge. We have one every single Friday (and if you want to catch the previous ones, just click here). These are always easy to do and will help you get further in your business — so are you ready to get started? You will need to grab your pen and paper. Now, this is obvious — you need to know your profit margin, but it’s very important to know the difference between the profit margin and the markup. Here’s an example for you: The profit margin relates to the selling price, while the markup relates to the buying price. So, if you buy something for $100, and sell it for $200, you have made a 50% profit margin. However, in relation to the buying price, you bought it for $100, and sold it for $100 more — that is a 100% markup. If that product was being sold for $300, and it cost $200 to buy, that would be a 1/3 profit margin (or 33.333%). However, as a markup, you paid $200 for the product, and sold it for $300 that is a 50% markup. It is very important to know this right from the beginning. I had a friend who mixed up those figures when he was working on the margin, and his business almost went under. because he did not understand the difference. Luckily he caught on before it was too late, and is doing very well for himself now. This is a simple mistake that many business owners are making. It would also be very helpful if you have varying profit margins on different products or services. You are going to have a higher profit margin on a service you provide, just make sure that you are including your labor costs. Now what this means is that for so many actions, how many of them were successful? So for every 100 people that land on your website, 2 of them buy something — that is a 2% conversion rate. Now, if you are not in E-Commerce, you probably think — “Oh that’s not many at all.” But in actual fact, it is the average number. That’s because a lot of people come looking for other things, that Google might have thrown a search result up for, and they are off looking, or they are just searching for information. If they want to buy something, maybe they will come back later — or something like that. You can have a conversion rate on your opt-in form. It basically tells you how many people see your opt-in page and how many people complete it. In a normal office setting, you may be doing phone sales, you might be getting leads by phoning people. So, for every 100 calls, you may get 20 appointments. That’s a 20% conversion rate. So, it’s important to know conversion rates of activities that are important in your business. Your goal is to work on increasing your conversion rates. Now, this is the same as I just explained, but this will be from a different traffic source. So for instance, your conversion rate from paid traffic to your website, such as Google Adwords, that’s going to be highest, because hopefully you are targeting your keywords, against your organic traffic. That means the free search result in Google, where people might have just been looking for information to help them with whatever need they might have had going on at the time. Because this is just a free search result, the conversion rate is likely to be lower than your paid traffic. 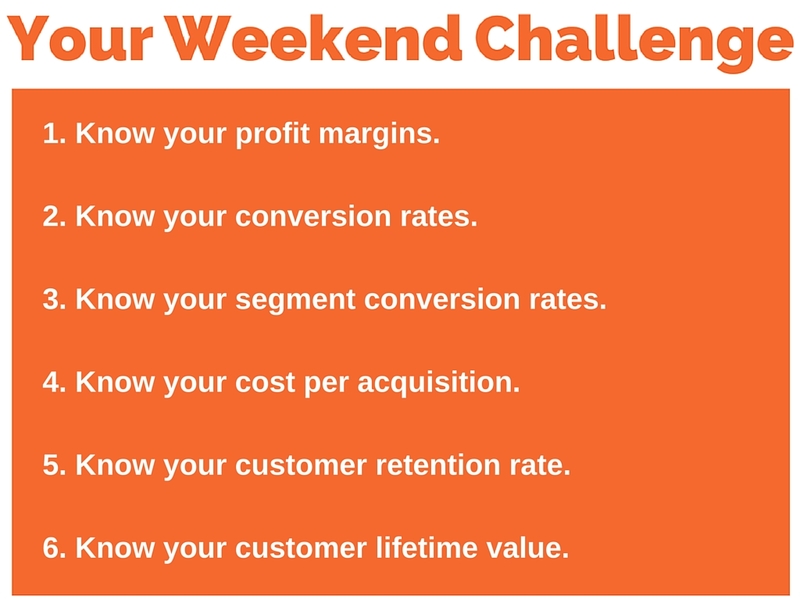 It’s also great to know your conversion rate from social media or your conversion rate from your sales people. Knowing the different conversion rates from the different sources or segments, means if one of them isn’t working, and one is working brilliantly, you can do more of the one that is really working for you. That is what I would recommend. And you can also work on the one that isn’t working so well and those two can learn from each other. From all of the above things we have already discussed — sending your sales staff out to make calls, delivering products, etc — how much does all of that cost? Do you actually get a sale? Are you selling to people through webinars? Perhaps you pay for a Facebook ad for this webinar, and 100 sign up to come, but only 20 show up. Then, of those 20 that turn up, 10% of those people buy something. So, for every $5 or $10 you spent on a Facebook ad to get that one sale, let’s hope that it was worth $1000 for that one sale! It’s good to know your cost per acquisition. It will be different for different channels. Then, once you know what it costs to acquire a customer, you know how much you can spend to get some more and try elsewhere. You are going to spend all that effort getting a customer, why not try and keep them? Now, in mobile phone companies, big organizations talk about customer churn. They have a rate of customers that leave. Now, they try and reduce their customer churn rate, but I would say, increase your customer retention rate, because that is more positive. So if you have a membership site, you may find on average, that your customer will pay a monthly fee, and on average, they stay for about 3 months. What can you do to make them stay for 4 months? Perhaps, more personal contact, a community manager who speaks to the members and makes sure they are getting value from everything. Perhaps more face to face live video streaming such as Google Hangouts or Skype. You need to make sure to add value that will make the customer want to stay. If they are getting value, they will want to stay. This one is SO important. Successful marketers will know how much their customers are worth over a lifetime. People who start from scratch have no idea. Let me give you an example — say your average sale is $100. However, every 1 out of 3 customers is likely to buy more than once. And you will find that those customers will buy on average, every 4 months. Their average order is around the same, so your customer lifetime value is all of those figures added together. So instead of it being $100 for that first sale, if you can keep that customer for a year, he’s bought every 4 months, he has spent $400. Now, from this point, you can go from here and say if he sticks around for 10 years, he will have spent quite a lot of money with you. What this means is you can spend enough based on him ordering twice, so you could spend and lose all your profit on that first order and spend that to acquire that customer, because you know that 1/3 of those customers are going to come back and buy again. So if you know the customer lifetime value, and how many become repeat customers, you can work out how much you can afford to spend and what it would take to acquire them. That is a very smart statistic to know. In fact, direct mailers and internet marketers that is one of the most important statistics because they will actually spend more to acquire the customer, have a loss on the first sale, because they know they will make it up on the back end. If you know all of these figures, then this will improve the health of your business. It may also open your eyes to some things that are good, and then some things that need improvement. Have a great weekend. I’ll speak to you on Monday. What metrics are you focusing on right now?